Chocolate or vanilla? You don't have to pick a favourite with this light and simple to make chocolate marble pound cake. Preheat the oven to 350°F. Butter a loaf pan and set aside. Whisk together flour, soda and salt in a small bowl. Set aside. Alternate mixing in the flour and the buttermilk to the electric mixer until combined. Dissolve the cocoa powder in the boiling water. Set aside. Scoop out a third of the batter and place in a small mixing bowl and stir in the cocoa mixture. 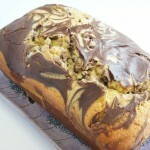 Use a large spoon to scoop dollops of vanilla and chocolate batter into the loaf pan. Make a checker board type pattern. You should have enough batter to make at least two layers of batter. Use a long skewer or knife, to swirl the batter together…making the beautiful marble effect. Bake in preheated oven for 50-60 minutes. Until toothpick inserted comes out clean. Remove from pan and cool on rack.